Aalayam - Colors, Cuisines and Cultures Inspired! 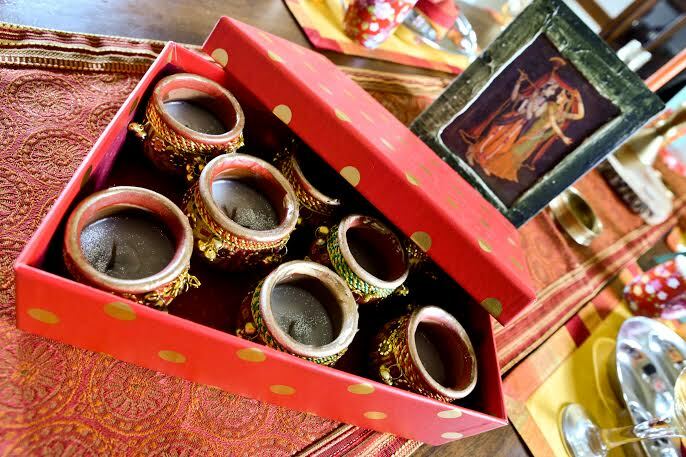 : Diwali tablescape - ethnic inspiration, the Aalayam way! Diwali tablescape - ethnic inspiration, the Aalayam way! Hello! It is Diwali and there will soon be a billion of us celebrating this festival of light and food and cherishing the bond that we share with our friends and family and I hope the preparations have picked up speed at your end as well? A DIY diwali card ...for that personal touch! Here is our annual Diwali edition- an Aalayam tradition! This time my Diwali tablescape is swathed in earthy colors and carries a haveli-esque feel and this was my attempt at capturing yet another shade of our fascinating culture. I have always wanted to travel to color and culture rich Rajasthan – maybe next year… This year though, I brought flavors of Rajasthan to my Diwali dinner table. 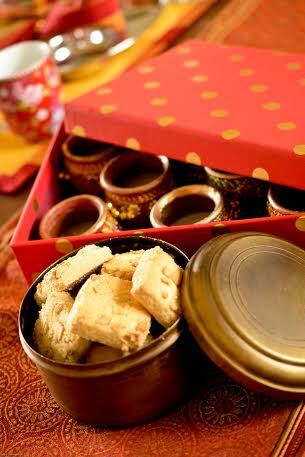 My tablescape is a tribute to the pomp and pageantry of Rajasthan that I have heard so much about. I have combined vibrant hues, miniature paintings, rustic and brass accents to reflect the earthen flavor of the Thar. This tablescape includes the hallmark of Indian décor –it is full of life and fit for a Maharajah! I had fun working with this exciting palette of colors and patterns. Did you like this Diwali composition? Write to me. It is going to be a quiet Diwali at home for us this year but I still want to savor mom’s epicurean delights, relive childhood traditions and soak in the sparkle that only Diwali night brings. And here is a simple attempt at creating a setting that appeals to the senses. This is going to be a festival seasoned with meaning and gratitude and we have much to thank for. The tepid glow of the flickering lights that metaphorically represent the essence of Diwali will serve as a gentle reminder of all our blessings. Supriya and I want to wish all of you a very happy Deepavali. I hope you all revel in the symbolism and gaiety and indulge in beautifying your homes as an uplifting reminder of the spirit of Diwali! We hope your celebration is beautiful regardless of whether you are honoring religious traditions or cultural customs. And we also wish that all of your dreams come true this Diwali. Wishing you all love and peace this Diwali! Thank you shaz! It is good to hear from you! we will be winding down with our christmas post and then some -stay tuned! Thank you pinky. Everything this year has been rushed and kinda last minute, it has been hard making time for the blog. Hopefully, supriya and I will find our groove again soon. Stay tuned for a couple of year end posts. Loves the entire look and the accessories and how you make it so special with that creative touch. Belated diwali wishes. Thank you. we are always appreciative of our readers comments! Thanks for coming back to read Aalyam again. Hi Deepa and Supriya, I'm new to your blog and love it! What a variety of topics, so eclectic and creative! Deepa, love the pictures in your posts. How wonderful to have a husband who will devote time to taking pictures for your blog.... Kudos to him! Btw, gorgeous colors on your Diwali tablescape....... I was wondering though.... As a design enthusiast.... How do you manage to entertain guests with such high center pieces on your dining table? Isn't it usually the norm to have low centerpieces so you can see each other across the table and converse? riyana - welcome to Aalayam - we try to make this a creative one stop shop for lifestyle inspirations. Glad you like our eclectic mix of posts. You are right, i typically like to keep it light n airy and allow for uniterrupted conversations - a couple of pillar candleholders is usually fine espcecillay since i have a bench seater on one side, that does not necessarily box guests into a slot and allows room for movement.